The Dennis Oland murder retrial resumes today. Later in that trial the defence admitted the shirt and jacket seized in the closet were the same ones Oland is wearing in the video but Miller is asking questions to Fredericks as though the issue is uncertain. Miller also interested in comparisons Fredericks was not asked to make on Oland’s shoes. Police found no blood or stains on shoes seized at Oland’s home and so didn’t care to match any of them to security footage. More tunnel vision by police is the implication. 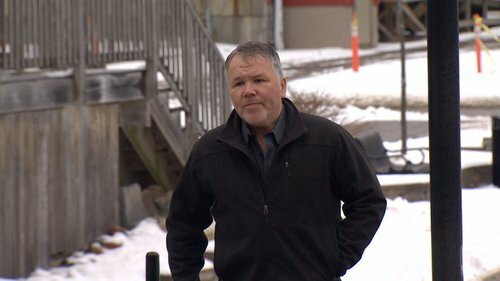 Fredericks wasn't asked to do any analysis of the 8 pairs of shoes police seized from Oland's home either, court hears. Defence lawyer James McConnell suggests this is a good time for the trial to break for lunch. Justice Terrence Morrison agrees, "as riveting as it is," he says, prompting laughter. Back at 1:30 p.m.
Dennis Oland murder trial day #25 - afternoon session. Alan Gold has made it to court and potential Oland alibi witness Anthony Shaw is here as well and will deliver his recollection of events the night of the murder. Afternoon session of Day 25 of Dennis #Oland 's murder retrial is about to get underway. Crown's next witness, Anthony Shaw, is seated at the back of the courtroom. Although he's a Crown witness, he's important to Oland's defence. Shaw had stopped in to help his friend John Ainsworth who was struggling with his computerized printing equipment on July 6. The printing shop was directly below Richard Oland’s 2nd floor office. Shaw says he onced worked for Ainsworth at the printing shop but years before the murder. Arrived at about 6 in the evening to help Ainsworth with a problem. What do you remember? A loud crash followed by a series of thumps - maybe 12. The noises came from just above us from around the middle of the ceiling. What did you do? Nothing - John and I just looked st each other and kept working. I owned a building like that myself. It sounded like someone moving furniture around or something like that. Shaw says his best guess is the noises happened around 7:30. Dennis Oland had left his father’s office around 6:30. Shaw was with Printing Plus owner John Ainsworth that night, helping him with a computer project. Testifies he heard a "large crash" and then 10 to 15 "quick thumps" coming from Oland's office upstairs. Estimates it was around 7:30 p.m., calling it his "best guess." Shaw says he was in and out of the building all evening between 6 and 9 having smoke breaks but saw no one come out the front door. At around 8 someone, a young man, showed up asking to send a fax. Shaw is hands down the best witness for the defence. IF what he heard was the murder and IF he has the time right Dennis Oland almost certainly could not have done it. Defence lawyer Alan Gold is handling cross-examination. After you heard the noises, did you hear any other noises? No. Clear the noises came from Oland's office? Yes. You've heard bands practising on 3rd floor before? Yes. Hear any that night? No. In trial #1 the jury found other events argued against Shaw’s recollection of 7:30 as being accurate but he has never moved off that account since he first offered it to police the day after the murder. Knee asks about the weather that evening which Shaw says was clear. Sunset in Saint John that day was around 9:14 so there would be few visual clues in daylight between 6:30 and 7:30 to distinguish time in that way. Gold requested a short recess. Seems like he might be almost finished his cross-examination of Shaw. Ainsworth also heard the noises and testified back to back with Shaw in trial #1 but is not here today. He had a less certain memory of the time, suggesting it could have been as early as 6:30. There’s been no information about how or when his testimony might come this time. Crown resumes playing videotaped testimony of forensic video analyst Grant Fredericks from Oland's first trial in 2015. Oland's then-defence lawyer Gary Miller is cross-examining him. Shaw has concluded and court has reverted to the viewing of 2015 testimony of video expert Grant Fredericks via courtroom monitors - a procedure as dull as it sounds. Justice Morrison sarcastically called it “riveting” before having it shut down over lunch. On the tape former Oland defence lawyer Gary Miller tries unsuccessfully to get Fredericks to comment on similarities in creases in the “crotch area” of pants Dennis Oland wore the day before the murder and the day after during his police interview. Fredericks says he can’t do that on the spot from copies of video tapes. Had police asked for a comparison he could have tried to make one he says but warns creases in pants change as the wearer moves and sits over time. Miller was making the point then - as the defence continues to make today - that red stained items that might implicate Oland were looked at closely and unstained items that suggest innocence like shoes and pants worn the day of the murder were ignored. Miller now asking Fredericks about images of Dennis Oland's VW Golf City, pointing out distinguishing features of the make and model. Oland drove the car to and from visiting his father on the night he was killed. Court has heard forensic examination of the car found no blood. Police did not ask Fredericks to provide any analysis regarding the car. Miller moves on to ask Fredericks about Dennis Oland’s car - a silver Volkswagen Golf. Miller made hay in trial #1 over the fact police had video of Oland’s car driving around and around the block the day of the murder but didn’t realize it. It was the defence who documented the car in all of the videos - a strategy that appeared to backfire at the end of the trial. All the video revealed a third trip Oland made to his father’s office the day of the murder when he had only told police about two. Again it seems all results were inconclusive, according to Fredericks' report, dated Oct. 28, 2018. The known car and questioned car were "consistent," and appeared to be of the "same class," but "no perceivable differences." Fredericks was retained by Saint John police to conduct the forensic video analysis of the car on July 6, 2018, according to an agreed statement of facts attached to the supplemental report. That's exactly 7 years after Richard Oland was killed. Dennis Oland retrial is adjourned until Thursday at 9:30 a.m., when the Crown will call its next witness.